This is a recipe from the Clean Eating magazine. It makes for a great dinner side dish and is a fun way to spice up a typical baked potato. Preheat over to 450 degrees F. Line a large baking sheet with foil. 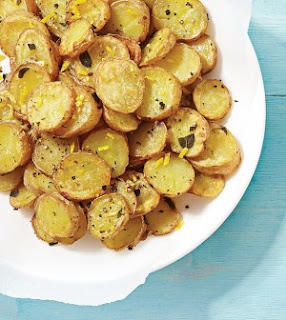 Place the potatoes on the baking sheet, drizzle evenly with 2 tsp oil and sprinkle with oregano and pepper. Toss to coat, then arrange potatoes in a single layer. Bake in the center of the oven for 20 to 22 minutes or until golden, stirring occasionally. Remove from oven. Sprinkle with remaining 1 tsp oil, salt and lemon zest and toss gently yet thoroughly.